An Australian senator who blamed the New Zealand mosque attacks on immigration was egged by a teenager earlier today (March 16). Following the shooting at two mosques in Christchurch yesterday (March 15) which left 49 people dead, Australian senator Fraser Anning released a statement saying ‘increasing Muslim presence’ was to blame. The right-wing politician, who has been a senator for Queensland since November 2017, tweeted ‘does anyone still dispute the link between Muslim immigration and violence?’ shortly after news of the attack broke. As always, leftwing politicians and the media will rush to claim that the causes of today’s shootings lie with gun laws or those who hold nationalist views, but this is all cliched nonsense. The real cause of bloodshed on New Zealand streets today is the immigration program which allowed Muslim fanatics to migrate to New Zealand in the first place. His remarks were rightfully and heavily criticised by many, including Australia’s prime minister, Scott Morrison. 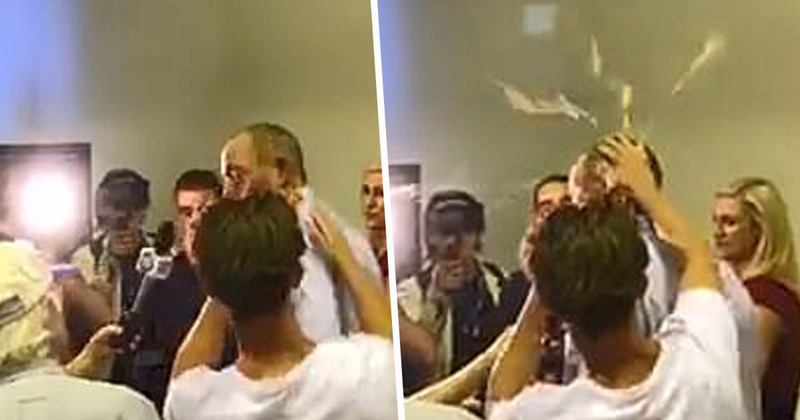 At a Conservative National Party Meeting in Melbourne today, Anning was confronted by a 17-year-old activist who cracked an egg on his head. Video footage shows the young man approaching Anning from behind and smashing the egg on the back of his head. The senator quickly turns around, taking a swipe at the teenager who is then tackled to the ground by other attendees at the event. As reported by ABC, the 17-year-old from Hampton was taken away by police, but has since been released pending further inquiries. The news outlet added a fundraising page has been set up following the incident, which will collect donations to cover the teenager’s legal fees… and to buy ‘more eggs’ of course too. An online petition has also been set up calling for Anning to be removed from office. Senator Fraser Anning has no place in the government of our democratic and multicultural country. We request that he be expelled from his position as Senator, and investigated by law enforcement agencies for supporting right wing terrorism. On the 15th of March, 49 innocent people were slaughtered in their place of worship. Fraser Anning, under the banner of Senator, made multiple offensive statements about this attack. At time of writing, it has received over 344,000 signatures.